Honeycomb is a well known candy in Australia and in the UK. For many people it’s synonymous with a Crunchie or Violet Crumble chocolate bar. It’s not that popular here in the United States and most people don’t really know what it is or what it tastes like. It has a distinct almost burnt caramel flavor with a dry crunchy texture. Why do I like it? It’s an essential ingredient in the creation of Bills Ricotta Hotcakes with Honeycomb Butter. “Those hotcakes sound amazing.”, I hear you saying. Don’t worry, a blog post about those delicious hotcakes and said butter will arrive shortly. When I do get the urge for these hotcakes the inevitable question is “Where will I get the honeycomb from?” There are two options, each with pros and cons. Option 1 – Buy a bunch of crunchie bars from the nearby supermarket or specialty grocery store and “extract” the honeycomb by shaving off the chocolate with a knife. Side note: Just wanted to give a shout out to my local deli/cafe/food store called Depanneur who stock crunchies. I’ve seen crunchies in lots of corner stores and supermarkets in New York these days. If you’re in NYC I’m confident that you can find it. 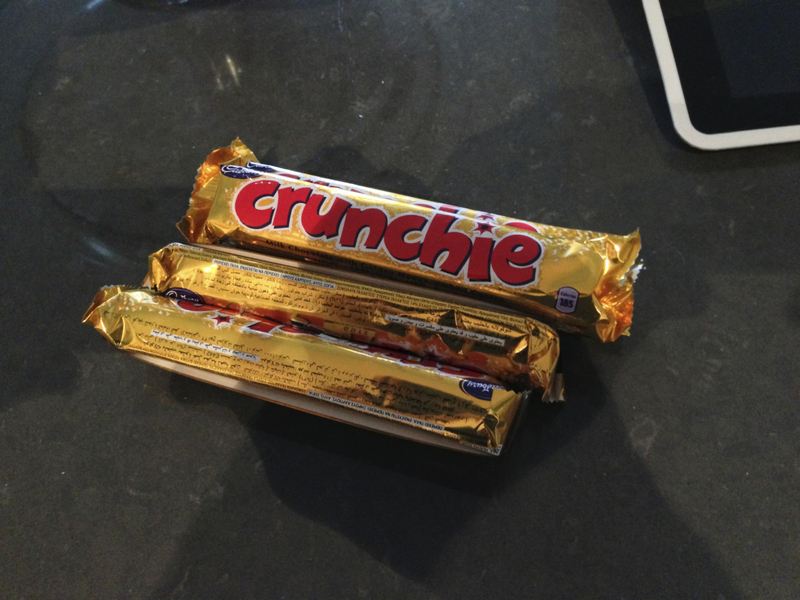 Here are some photos of my handywork with Crunchie bars in the past. PROS – Low risk and can be a time saver. CONS – Waste of money plus these are chocolate bars so there’s a bit of effort involved in scraping off the outer chocolate layer to get what you’re after. Hmm, what would you do with all that delicious “unnecessary” chocolate I wonder? Now Bills recipe (for example) says that for a decadent treat why not use the crunchie bars as is but honestly it’s just too rich. Also, I want to re-create Bills dish. I don’t want chocolate honeycomb butter, I want honeycomb cutter. 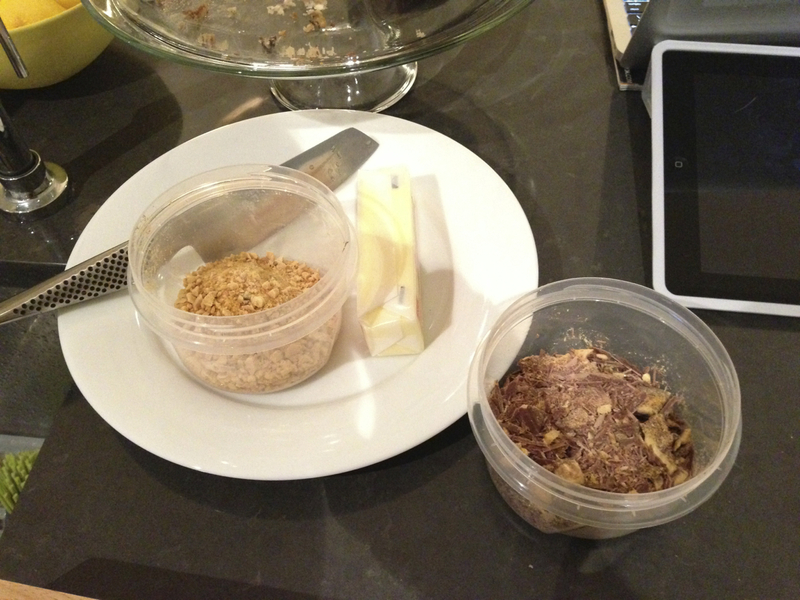 Option 2 – Make it from scratch which is what this post is all about. PROS – You have the satisfaction of knowing that you created all components of your dish from scratch and you have lots of spare honeycomb candy lying around. CONS – High risk and multiple attempts may be necessary. Also, be careful when making your honeycomb. The sugar will get incredibly hot and will burn if not handled properly. Oh and your dentist is gonna hate you. Ok. Let’s get cracking and make us some honeycomb.